Today we feature an incredible young photographer named Sterling Graves. At the age of seventeen, Sterling turned his favorite hobby into a successful, growing business. 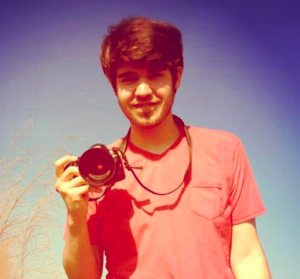 As a young man with tons of creativity, he loves to serve people through the art of photography. #LF: How does following Jesus fuel your passion for photography? I believe that Jesus is the prime example of passion. His love, life, and word is full of passion for us to experience and an example to live out. Not only did He live fully, He died fully, and He fully lives again. As a Christian, I want to try my best to be a living sacrifice of who Jesus was. I believe that in Him, I am a new creation. I am no longer what the world wants to define me, but rather a co-heir with Christ. How fully can you live if your passion isn’t being transformed by God and the things He has for you? #LF: How do you seek to impact people through your photography? As the last of 6 kids, I have 4 older sisters. Being in the house with 5 women, I know how much physical appearance can matter. It’s not a bad thing, and having the desire to feel beautiful is one of the most prominent needs in a female’s heart. That’s where I come in. I’m all about making the people I’m photographing feel like a top model, helping them understand that they are fearfully and wonderfully made by a Father who loves them for who they are. That goes for all sorts of people, not just women, and not just people I’m taking pictures for. God loves them. They have a story. I just want to listen. #LF: Why is it important for you to improve in your craft of photography? Photography really has been the only thing that I’ve been pretty good at, and with practice, I turned one of my favorite hobbies into a successful business at the age of 17. I’m 18 now, and I have a lot more learning to do. The reason I believe it’s important to keep getting better is because I have a lot more places, people, and things to capture. I don’t ever want to be okay with the level I am currently at, but I want to always be living to my full potential, pushing my limits. The better I get, the more I get to experience. #LF: Who is a role model for you in the world of photography? A great example would be Jeremy Cowart. He’s one of the world’s best photographers, and he only started about 6 years ago. Now he is shooting Tim Tebow, Ryan Seacrest, Chris Tomlin, and Carrie Underwood! He has this incredible platform to reach out to other people, other photographers, and other lovers of Christ.